The Aspen® LSO LoPro ("Low Profile") provides targeted compression along with comfortable support. The motion restriction provided by Aspen's LeverLatch™ mechanism is significant, without compromising comfort. 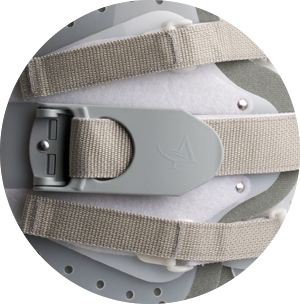 The unique, three-piece design featuring symmetrical side panels allows patients to easily tighten the brace with either hand while providing even compression throughout the tightening process. Forms a structurally rigid polyethylene cylinder that restricts motion, yet is easy to trim or shape while on the patient. 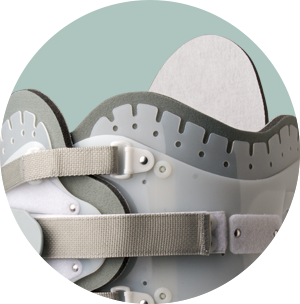 Gives the patient a strong mechanical advantage to easily and effectively tighten the orthosis for better restriction and support. Aspen braces conform and adjust to each patient as they are tightened. The CushionFlex Tabs™ and breathable cotton-lined replacement pads further soften the interface. For added comfort, the upper and lower edges can be modified to relieve pressure over anatomical contours, bony prominences, or bone graft sites.